A number of family photos are available. Like many old New Orleans families, my Frey cousins' ancestors emigrated from several areas of France. The Frey line comes from Scherwiller, Bas-Rhin, Alsace. The Anseman and Jacquot families probably came from the nearby areas of Marne and Lorraine (northwest of Bas-Rhin). 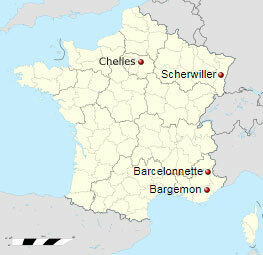 The Teissier and Gebelin lines originated in Barcelonnette and Bargemon in southeast France, while the Morel family was from Chelles on the outskirts of Paris. The following chart is believed to be an accurate representation of the connections between known DNA matches to my Frey cousins. Corrections are greatly appreciated, as is information about additional Frey, Anseman and Teissier descendants who have tested. Nicolas Frey was born in Scherwiller, a small village in the far northeast of France, on 11 Dec 1848. The town stands at the intersection of two Roman roads, in the middle of the Bas-Rhin department, in the Grand Est (formerly Alsace) region. Alsace, located along the Rhine River adjacent to the Germany border, has had a tumultuous history. Its location and rich soils have made it a center of turmoil and conquest for thousands of years. Bas-Rhin was established as a department during the French Revolution in 1789. All of Alsace and parts of Lorraine were annexed from France to Germany in 1871 at the end of the Franco-Prussian War (and remained a part of the country until the end of World War I). Residents of the regions were allowed to retain their French citizenship only if they submitted a declaration of citizenship in 1872-3 and moved away from the area. On 20 July 1872, Nicolas Frey stated on his French citizenahip declaration that he was a resident of Nouvelle Orleans / Etats Unis. It's not clear if he left the newly established Alsace-Lorraine area of the German Empire for New Orleans at this time - or if he had done so previously. Many young men left the region to escape conscription into the German army; Nicolas was 24 years old. After emigrating to New Orleans, Frey Americanized his name to Nicholas. He married Ophelia Aline Anseman on 30 Jan 1873. They had ten children, seven of whom lived to be adults. Nicholas died on 29 Jul 1910 in Orleans Parish, Louisiana. We don't yet know the parents of Nicolas. However, there were many Frey residents in Scherwiller and in Bas-Rhin when Nicolas was born. Additional Frey AncestryDNA tests may help us determine his ancestors. As of December 2017, my Frey cousin AF has one strong Frey DNA match to a third cousin. Ophelia Anseman (often spelled Ansemann) was born in New Orleans on 4 Sep 1850 to French-born parents, Nicholas Anseman (about 1811 - 5 Aug 1874) and Marguerite Jacquot (about 1812 - 3 Sep 1894). There is some disagreement as to the date and birthplace of her parents, but they were almost certainly born in the northeast area of France. Nicholas Anseman was 25 and his wife Marguerite was 22 when they arrived in New Orleans on 23 May 1835 on the ship Salem with their first child Nicholas. They had nine additional children who were born in New Orleans. At least nine and possibly all ten of their children lived to adulthood. Ophelia was their ninth child. My DNA-tested Frey cousin AF has strong DNA matches to many Anseman descendants. Charles was the seventh of Nicholas and Ophelia's ten children. He was born in New Orleans on 11 Feb 1882 and attended Soule College and Tulane University. After earning his civil engineering degree in 1903 at Tulane, he worked in levee construction on the Mississippi and Atchafalaya Rivers. In 1905, Charles married Noemie Augustine Teissier of the Bourbon Plantation in St James Parish and later moved, in 1918, to New Orleans. He became an agent of the New York Life Insurance Company in 1912. After his wife's death in 1952, he continue to work until the age of 80. He then moved to California in the early 1960s, where he lived with his daughter Evelyn and her family until his death on 12 Jan 1969. Noemie was born on 17 Aug 1878 in St John the Baptist Parish, Louisiana, to immigrant parents from southeastern France. Her grandfather, Jean Pierre Teissier (henceforth JP), grew grapes for wine and his eldest son Joseph would inherit the property. Noemie's father was his second son Jean Baptiste Teissier (1837-1893) - henceforth JB. JB was sent to Uncle Joseph (Abbe) to be educated in some profession. While there in 1855, a family friend, Casimir Jaubert, returned from the United States where he operated wholesale dry goods stores in N.Y., New Orleans, and Mexico. Casimir persuaded JP to send his two younger sons to manage plantation stores that were outlets for his wholesale products. JB prospered, and at the end of 1886 he purchased a 50% interest in the Bourbon Plantation, a sugar plantation located on the east bank of the Mississippi River about 55 miles north of New Orleans. On 18 May 1991, JB purchased the remaining 50%. After JB died on 29 Aug 1893, his children and heirs hired managers to run the plantation until 1907. After encroachments of the river onto the property and a serious decline in the sugar markets, JB's daughter Noemie bought out her relatives' 80% interest in the plantation. In 1916, Noemie sold most of the plantation to Colonial Sugar Company. The sugar house was dismantled in 1930, and much of the machinery was purchased by Henry Ford. It became a significant exhibit at the Henry Ford Museum in Dearborn MI for about 60 years; the equipment is currently in storage. My cousin AF does not yet have any Teissier DNA matches outside of the Frey line. Interestingly, she matches to four Tessier decendants (note the spelling difference) from the earliest settlers of Quebec. It's not yet known if she matches them on their Tessier lines - nor if their Tessier lines are related to AF's Teissier line. Charles and Noemie's son Charles was born in New Orleans on 23 May 1917. He graduated from Tulane University in 1937, and was a member of Alpha Chi Sigma fraternity, the Glee Club, the Oratorical and Debating Council, the Glendy Burke Literary and Debating Society, and Varsity Debating. He met his future wife (and my grandfather's first cousin) Louise Myrtle Ireland at Tulane Medical School. They married on 10 Jun 1939 and had four sons after Charles returned from service overseas during WWII. Louise was the daughter of Harry Arthur Ireland and Myrtle "Clara" Kahl. After their deaths, Louise and her sister Lucile established the Ireland-Kahl Scholarship at Kansas State University in their memory. AF has strong matches on both her Frey and Ireland-surname lines. We currently have one Frey DNA test, from AF, a fifth-generation American Frey. Her father is deceased, but she has two living Frey uncles. Although AF inherited some DNA that her uncles did not, they will generally hold twice as much Frey (and associated lines) DNA as AF. It would be a tremendous help to our Frey, Ireland, Teissier, McCool and Anseman research (and especially for even earlier lines) if the two of them, and other cousins, would test. Much of this information came from Ancestry user kmeinzen who has done an excellent job in researching the Teissier family history. Her work is available for viewing by Ancestry members. I can provide access to my extended family members upon request. There is a large tree of Jacquot descendants in the Alsace and Lorraine area of France at https://www.ancestry.com/family-tree/tree/45401224/family?usePUBJs=true. It's possible, but not yet known, if this is a connected family.